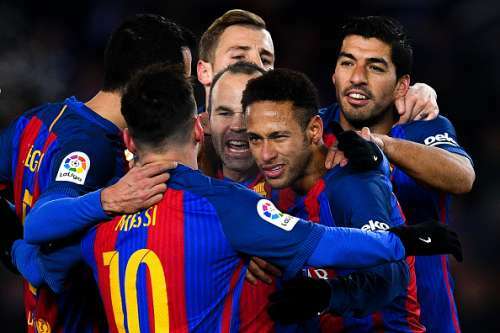 All eyes were on Barcelona on Sunday, given that this was their first big test after the horrendous 4-0 defeat at Parc des Princes a fortnight ago in the first leg of the Round of 16 in the UEFA Champions League. This was especially true for under-fire manager Luis Enrique as there was no doubt that right from the youngest Cules de Barcelona going to school, to the arm-chair experts seated in the studio, all would have an eagle-eye on him every time he rolls the dice. However, due credit needs to be given to him not only for dealing with the colossal amount of expectations for the third year in charge as the manager of the Catalan team but also for the gambler that he is. The Asturian was undaunted by the pressure mounted on him and further went on to prove it via his tactical tweaks for the game, which arguably was make-or-break for Barcelona. 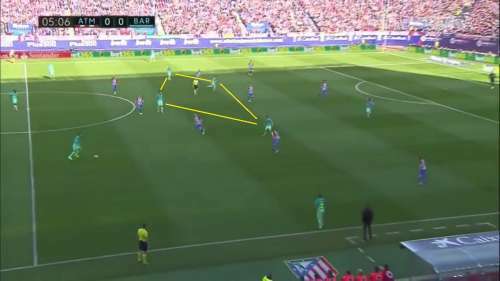 Along the same lines as Barcelona, it is no secret how Diego Simeone’s men play in terms of formation, system, style of play and approach. They know what their strong suit is and they always stick to their ‘go-to’ 4-4-2. In the first third, the Catalans have always preferred short-passing by splitting the centre-backs wide, making the pitch as wide as possible and beating the first line of pressure before penetrating into the opponent’s half. 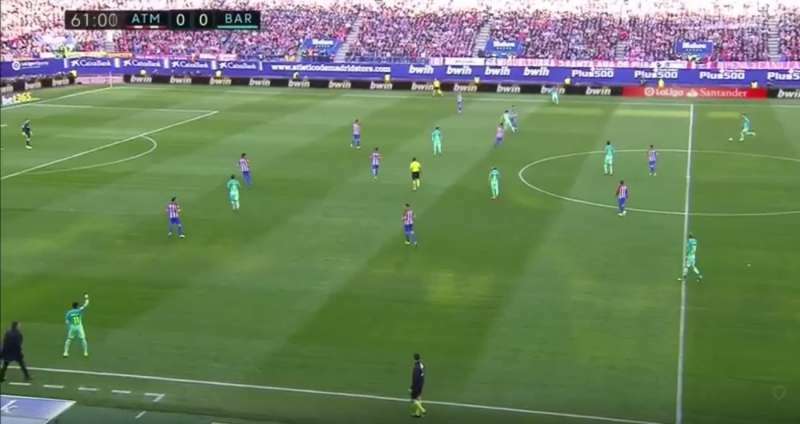 In recent times, many teams have identified this and they have pressed Barca as high as possible up the pitch to disrupt their passing and force errors. This is one such example: PSG pressed Barcelona high up the pitch early on in the game, thereby forcing errors/mispasses by ter Stegen, Pique, and Umtiti. a) It is up to Enrique’s men to start resorting to more long balls from the back to skip the high-pressing in their own half. However, this solution is practically difficult to implement with the variety of players in the Barcelona locker room. The midfielders are technically sound, they possess a superior passing range and high work ethic. When it comes to strength, and physique they aren’t anywhere close to the likes of N’Zonzi, Matic or Kante, though. So given they go for long balls, it would be quite unlikely that they win the first or second ball and would instead lose possession. Conversely, the reason why the Blaugrana have gone for midfielders of this profile alone is because of the strong faith in their philosophy and the football on which they have thrived over the years now. b) The alternate solution would be to outnumber the opposition in the first third to have more passing options and overcome the high-pressing. So this is what the 3-4-3 brings to the team when they faced Atletico’s 4-4-2, that the front two of Atletico are up against a back-three of Barca. So if Atletico try to press the three centre-backs with their two strikers, there would always be a spare man, making it easier to play out from the back. Once the Catalans have played through the first line of pressure, they generally start suffocating the opponents by moving the ball quickly to the front 3. So the back-three was handy in helping them achieve this. Another key element of this formation was the number of passing options available to the center-backs in possession. Especially when all three at the back are ball-playing defenders, more options made it easier for them to penetrate, switch of play or aerial balls directly to Luis Suarez. The yellow lines represent the midfield diamond of Barcelona comprising of Sergio Busquets at the bottom tip of the diamond, Andres Iniesta on the left, Sergi Roberto on the right and Lionel Messi on top of the diamond in a typical No. 10 position. The four midfielders held a narrow position in the centre of the park to outnumber Atletico’s midfield two of Gabi and Saul Niguez. 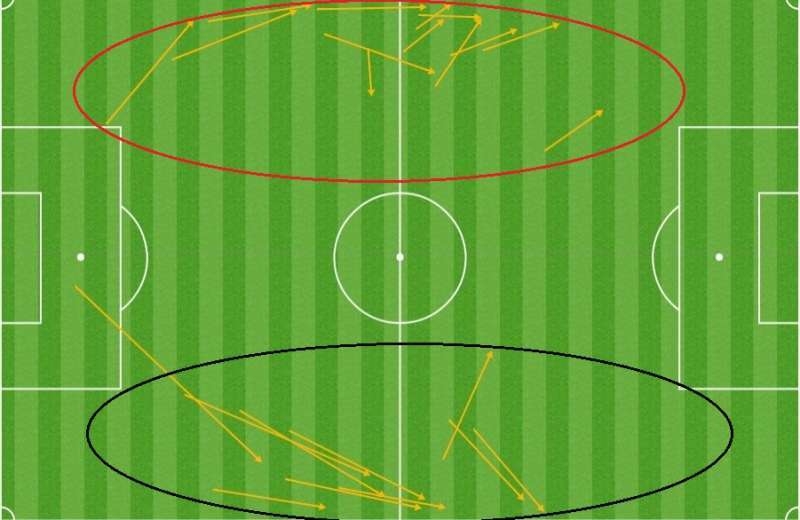 Adding to that, they were able to provide simple, direct passing options to the side center-backs Pique and Mathieu. Pique plays Suarez directly by creating space behind the Atletico Madrid full-back. 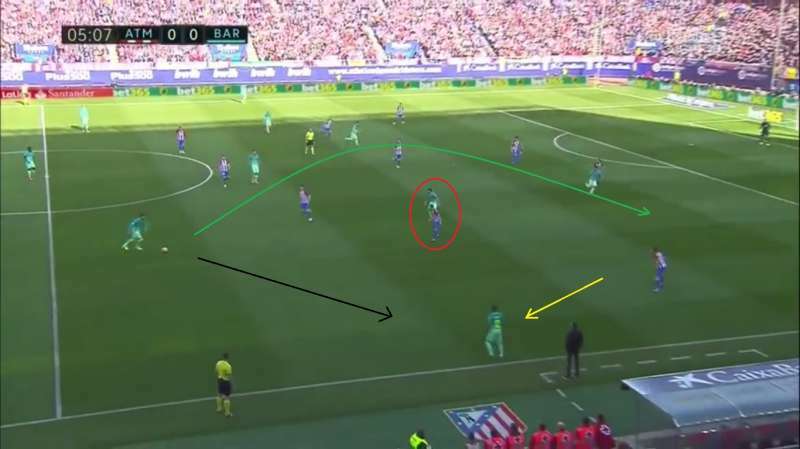 In order to avoid being outnumbered in midfield, the Atletico Madrid wingers - Yannick Carrasco and Koke tucked in to central areas to mark the side midfielders of the diamond – Roberto and Iniesta. 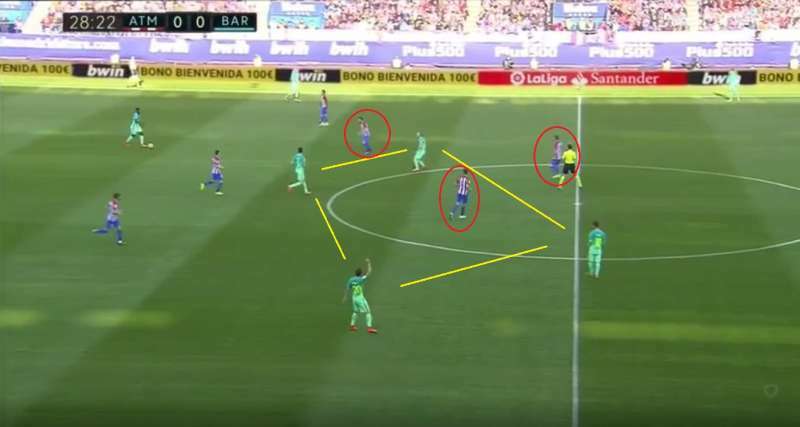 This is where the brilliance of the 3-4-3 combining with precise player movements began to suffocate Simeone’s men. Here, Carrasco tucked in to mark Roberto (circled red) to avoid Pique’s direct straight pass into Roberto’s feet. 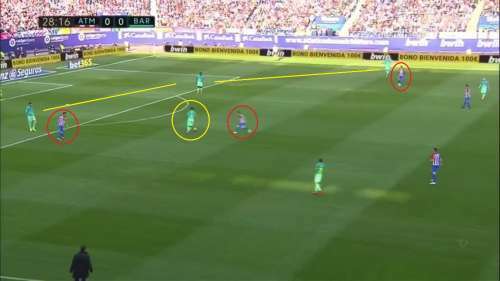 This opened up a free passing line (black arrow mark) for Pique into right winger Rafinha, who had come short to create a passing option. Since Rafinha opened up a completely free passing option for Pique, the Atletico left-back Filipe Luis was drawn towards him (yellow arrow mark) out of position. This created a space between centre-back Diego Godin & Filipe Luis, into which Luis Suarez decided to run and Pique played it comfortably on top of the entire defence into the dangerous space. Eventually, Suarez ended up winning a free-kick in a dangerous position but Atletico were just left off the hook. Rafinha gets time and space on the ball as Filipe Luis holds his position. As we just saw, Atletico were stretched at the back owing to the positioning of the midfield diamond and the direct balls from the back three to the striker. 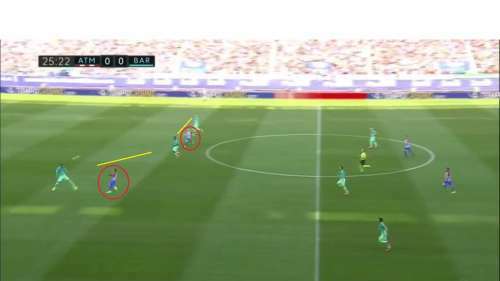 To avoid this danger, Filipe Luis (circled red) decided to stick to his position and allow Rafinha (circled yellow) to go short and receive passes from Pique. This allowed Rafinha time and space on the ball from where he could comfortably dribble towards the centre and switch play. Whatever we have seen thus far with Pique and Rafinha on the right was mirrored by Mathieu and Neymar on the left flank and that is where much of the danger was created as Neymar was on song. Thus, whenever the ball was fed to the wingers from the centre-backs, Atletico did not know whether to close down immediately or hold position; they also were clueless as to whether close down the wingers or hold their positions. Enrique’s men had made attacking using the wings a vital part of the system. 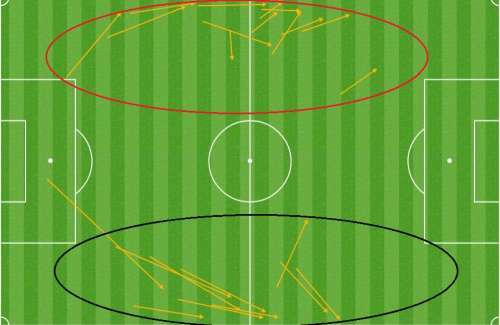 The numbers prove the same as the 2nd most used passing combination (13 passes) for Barcelona was Mathieu to Neymar (circled red) while Pique to Rafinha (circled black) stood as the 5th most used (10 passes). Unsurprisingly, the first, third and fourth most used pass combinations are between the centre-backs between themselves (1st Umtiti to Pique, 3rd Pique to Umtiti, 5th Umtiti to Mathieu). The tactic was to build up slowly using the three centre-backs, use the wingers to tilt the opposition to one side and then switch play quickly or to take on the full-backs 1v1. Another added advantage was that both Neymar and Rafinha were inverted wingers; That is, right-footed left winger and left footed right winger. This helps them have the ball in control on the stronger foot and shield it from the pressuring full back or to dribble towards central areas. It is evident that the wings were where Barca pretty much made things happen. One might wonder why Messi was moved out of the right wing which he has in recent times made it his own. Given that there are no wing-backs, a high defensive work-rate was required of the wingers for this system to succeed and the above table provides us with the numbers as to how much the two wingers have contributed defensively. Also by deploying Messi at a number 10 position, his creative mastery could be utilised to the fullest without him bearing the onus of tracking up and down the pitch. This was the trend for the majority of the game but Atletico did not go down without tactical adjustments of their own. In order to counter the numerical superiority of the three-man backline of Barcelona, Carrasco joined the front two as the third man to press and make it 3v3. Thus, occasionally Atletico shaped up in a 4-3-3 formation with Carrasco, Griezmann, Gameiro pressing high up and Koke, Gabi and Saul staying in midfield. Whenever this happened, Busquets dropped deep to help the back-three. He positioned himself just in front of the defence to make it 4v3 at the back and thereby maintaining the numbers advantage and helping play out from the back. The three Atletico Madrid players (circled red) try to press the back-three to make it 3v3 while Busquets (circled yellow) drops deeper and makes it a 4v3. Here, there is a small 1-2 passing between Busquets and Umtiti, allowing the latter to charge forward with the ball at his feet. 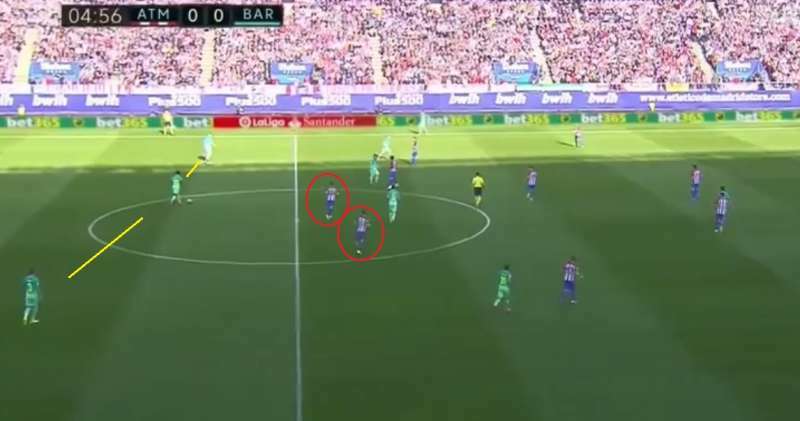 This is the picture a few seconds after Busquets dropped deep to outnumber the Atletico front three's pressing. Enrique’s men had comfortably beaten Atletico’s first line of pressure but since Carrasco stepped forward to join the two strikers to press the Barcelona backline, Atletico lost a man in central midfield and then there was a 4v3 in favour of Barcelona again. The diamond (connected by yellow lines) stayed narrow in the central area and outnumbered Atletico’s midfield three of Koke, Gabi and Saul Niguez (all 3 circled red). In truth, Barca didn’t have to work a lot defensively except to cope with the initial moments of high pressure in the first half. Predominantly, it was only about stopping the potential counter-attacks lead by Griezmann and Gameiro. Here again, the advantage of three defenders against two strikers worked pretty well for them and they were able to deal with them quite comfortably. So even defensively, the three-man backline turned out favourable for the Catalans as in the recent past; a dip in the form for Busquets combined with the shaky centre-back pairings often led them to concede. Atletico were able to create only two chances on the counter out of which one (52’ min) was saved by Ter Stegen and the other (62’ min) deflected out for a corner. There were occasional stints of possession for Atletico but Barcelona were solid with Roberto tracking back along with Rafinha to cover the right. 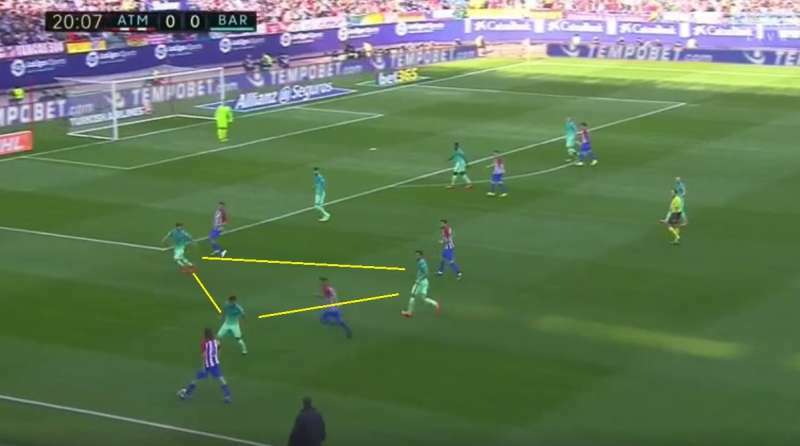 While Atletico did try to outnumber Barca on the flanks with Carrasco, Filipe Luis and one of the central midfielders to make it 3v2, Busquets could slide to the right to cover and balance the numbers. Similarly, Mathieu would cover the left flank by drifting wide while he gets assistance from Neymar & Iniesta to avoid being outnumbered. Owing to this, as the game unfolded Atletico could not stop Barcelona from taking the driver’s seat, and in the second half, the reigning La Liga champions were in full control, squeezing Atletico further and further into their own half. 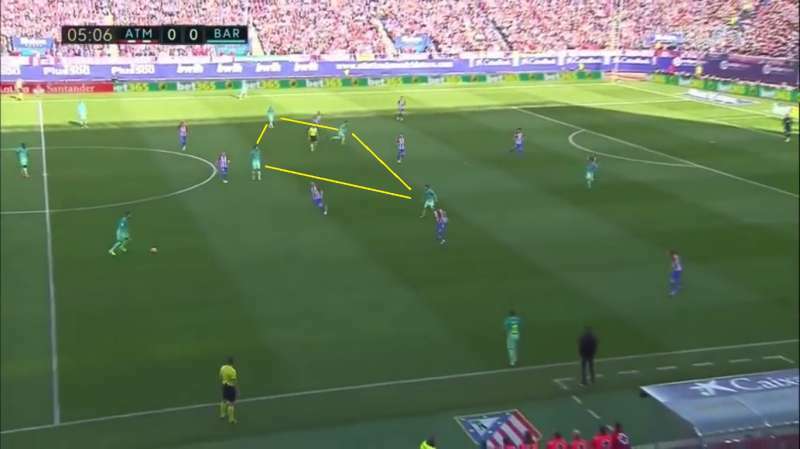 This made it all the more difficult in the later stages for Simeone’s men to counter quickly. Although the goals were scrappy, due credit needs to be given to Enrique to have chosen this formation, especially for a game of this stature, and it undoubtedly helped them keep the title rivals at bay, in their own backyard. Anything could have happened if the traditional 4-3-3 was retained as the numbers game could have turned out quite different, right from the build-up play to dealing with the high pressing and stopping counter-attacks. When asked if three at the back would be a permanent change, the Barcelona boss remained hesitant in revealing anything about the change in recipe in the Catalan kitchen and simply responded by saying, “I liked it”. 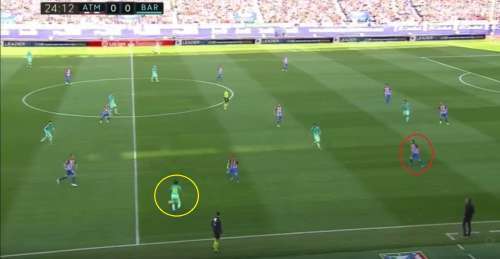 In the game against Sporting Gijon, he again went for the back-three with Mascherano, Umtiti and Alba, and Busquets providing cover when Alba charged forward. Barcelona’s passing looked fluid and the defence comfortably dealt with the counter owing to the third man in defence. We will have to wait and watch if a story similar to the one being written in London by a certain Italian manager named Antonio Conte with a three-man backline, can be replicated 1000 kilometers away in Spain.